Only two days after its Halloween sale ended on October 31, a Toys "R" Us store in Zhongshan, China, began its Singles Day sale. So would the store begin another holiday sale two days after Singles day on November 11? I briefly stopped by the store on November 13, and the answer was "no". There wasn't a sale of any variety. Personally, I found something satisfying in seeing the store sale-free. Perhaps having zero intent to buy anything was a factor. Perhaps it was because I had wondered if they would have already started a seemingly inevitable Christmas sale. But at least there was still something new which intrigued me, though it might be something I just didn't notice before. To be honest, I haven't ever memorized the store's full inventory. The 330 ml bottles of water sell for 3 yuan (currently about U.S. 43 cents) each or 5 yuan for two. 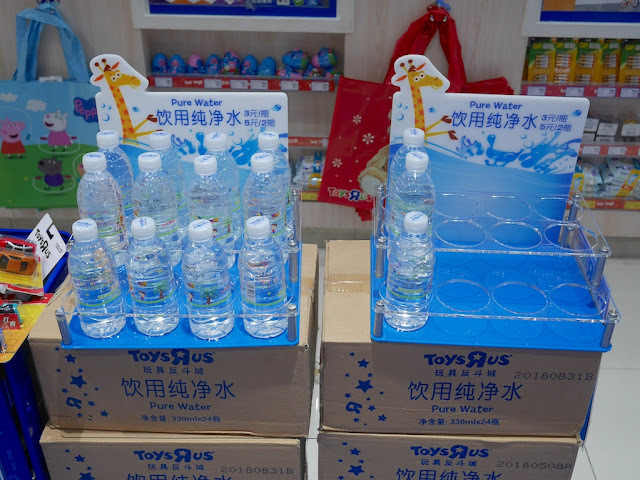 For comparison, 500 ml bottles of two popular brands of water — one spring water and the other purified water — commonly sell for 2 yuan each at convenience stores in Zhongshan. And cheaper prices can be found at grocery stores. In the past, Toys "R" Us sold Babies "R" Us Purified Baby Water by the gallon. It included minerals intended to make it better for mixing with infant formula. And Toys "R" Us Canada currently sells Ice River Springs Nursery Water. But what is sold at the Toys "R" Us in Zhongshan is just regular purified water bottled in Jiading, Shanghai. So why would Toys "R" Us sell it? And why would people spend more for it? I asked a store employee why they were selling water and didn't get anything more meaningful than "no reason". Well, Toys "R" Us most likely does have reasons. It is possible some people desire it and are willing to pay more because of the colorful label or the branding. But other more pragmatic explanations are also possible. For example, Toys "R" Stores I have visited in China typically have some open toys set out such as building blocks that typically involve longer term interactions. Now a parent can take care of their thirst or their child's without needing to the leave the fun. So, there's the possibility of both increased happiness and increased sales. Whatever the motivations, out of due diligence I sacrificed 3 yuan so I could do a taste test. I can report that Toys "R" Us Pure Water tastes just like water. I don't expect to buy another bottle. No reason why.